Transit Ramps & Lifts – Lift-U | A division of Hogan Mfg., Inc.
LIFT-U® has been providing reliable wheelchair lifts and ramps since 1978. 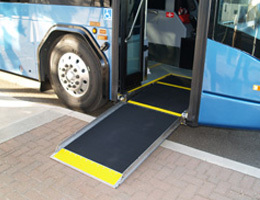 For the past 30 years, LIFT-U® has been the leading wheelchair lift and ramp manufacturer in the United States and Canada for the bus transit industry. With over 50,000 units manufactured and in use, our products have established a reputation of being the most reliable, sought-after, leading-edge technology in the industry. The newest generation model LU11 Wheelchair Ramp not only offers a reduced slope of 1:6 but now facilitates an increased load capacity of 1000 pounds. All major ramp components including the ramp plate are manufactured out of stainless steel for corrosion resistance. Aluminum is not used to avoid galvanic corrosion. The LU11 has completed a 2,000-hour salt spray test, after which the ramp operated without the need of repair or lubrication. The model LU10 Wheelchair Lift is our SOLID PLATFORM on-board lift. The lift is mounted in the stairwell area beneath and parallel to the vehicle floor at bottom step elevation. When not in use, the stowed lift serves as the bottom step of the vehicle, allowing the intermediate step(s) to remain permanently fixed. When in use the lift platform extends horizontally outward and raises or lowers between ground level and vehicle floor level. The LU10 is hydraulically powered and electronically controlled. 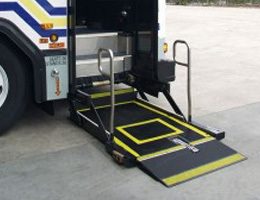 The model LU12 Wheelchair Lift, is our STEP / PLATFORM on-board lift. The lift can be mounted either at the front or rear door entrance. 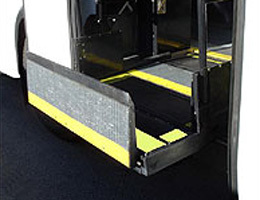 While in the stowed position, the wheelchair lift becomes the steps of the bus. 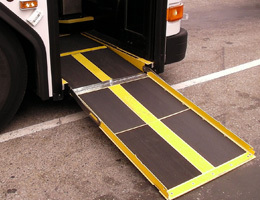 When deployed, the lift extends horizontally with the steps forming the platform and lowers to ground level, or raises to bus floor level. The LU12 is hydraulically powered and electronically controlled.